Nuclear Medicine studies give a detailed view of what is happening in the body at a molecular or cellular level. This type of medical imaging is used to diagnose and manage the treatment of cancer, heart disease, and disorders of the lungs, bones and kidneys. Nuclear Medicine exams use a radiopharmaceutical (a substance that emits a small amount of x-rays from within the body). The x-rays, or gamma rays, are measured with special detectors. PRI radiologists are among the most experienced in the Greater Cincinnati area in interpreting PET scans and correlating PET with other imaging modalities, such as CT and MRI. PRI radiologists were the first to begin interpreting PET scans in the city of Cincinnati. The PRI radiologists who interpret PET imaging have developed excellence in interpreting a high volume of PET imaging used in the initial diagnosis, staging and subsequent re-staging of many different kinds of malignancies, such as lymphoma and myeloma and cancers of the lung, breast, prostate, reproductive tract, pancreas, head and neck, and skin. Our radiologists work closely with the referring physicians to aid the referring physician in determining the appropriate course of action or therapy for their patients. 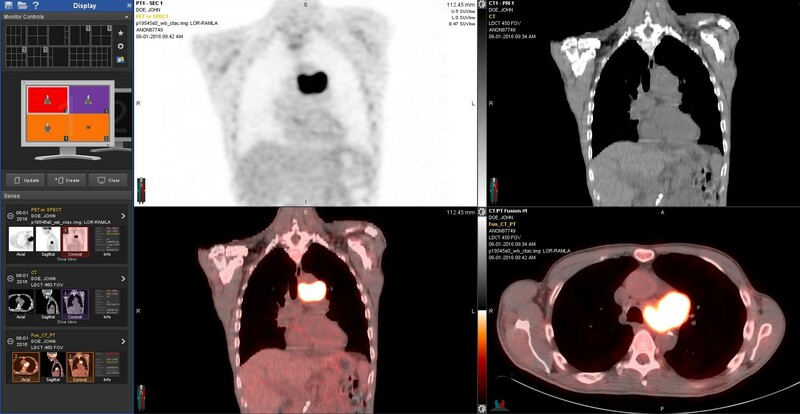 PET/CT scan showing hypermetabolic tumor within the chest.